Oh, yeah! This is "MOJO MONDAY" alright! I received not just one, but TWO packages in the mail today!! Wahoo! 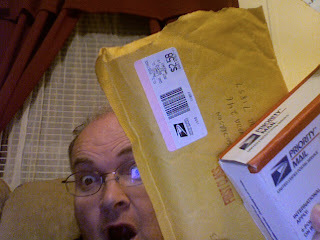 The USPS Box is from Mr. Peterson (aka PunkRockPaint, of course!) and the bubbleope (not to be hunted in the wild) is from Steve (aka WhiteSoxCards)! I have not had a chance to go through either one, other than to read the notes inside. I have to say, one thing we card bloggers seem to share is a whacked-out sense of humor! I'll share the cards and the notes in a later post. THANKS so much, guys, for what I know is going to be a fun-filled trip through the Tribe cards packages!! I am glad you got the package... I forgot to mail some vintage Indians, so expect an envelope soon...ish.